COULD this be the game-changer the electric car industry needs? 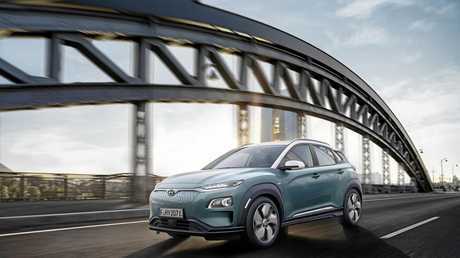 Hyundai has revealed its electric-powered Kona compact SUV - with a range of up to 470km from one charge. While that figure is the European test cycle, expect real-world driving to deliver about 300-350km. The BMW's i3 achieves about 200km and starts from $68,700 plus on-roads. The Tesla S 75D starts from $130,699 plus on-roads and has a claimed range of 466km, while the Model X 75D SUV has a price-tag of $140,202 and a range of 565km. Tesla's most affordable variant, the Model 3, is expected to cost about $50,000 but has been plagued by production delays and quality issues. Full pricing details are yet to be revealed, although Hyundai is hopeful of something in the mid to high $40,000 realm. 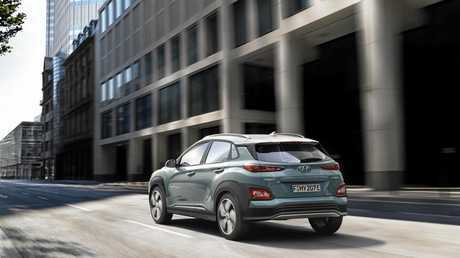 Arriving in Australia late this year the Hyundai Kona Electric features two powertrains. The long-range battery version provides driving range of up to 470km, delivering a maximum output of 150kW. With a battery capacity of 39.2 kWh, the basic version drives up to 300km on a single charge with the motor delivering 99kW. Charging time for the smaller capacity battery is 6hr 10min using a standard household plug, or 54 minutes to 80% using a 100kW quick charger. The larger battery takes 9hr 40min at home on a basic plug, and also 54 minutes to 80% on a 100kW fast charger. 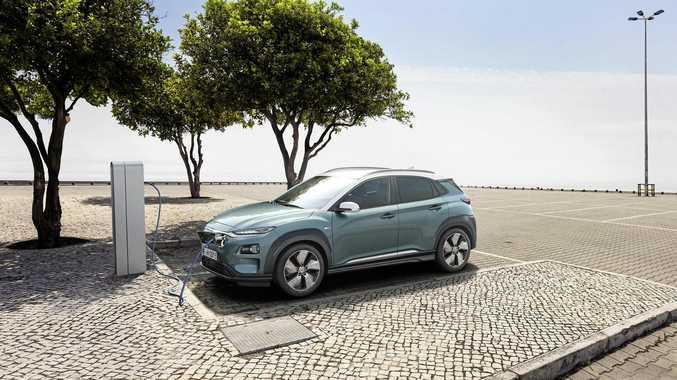 Hyundai expects to offer a home fast charge facility which could be installed that would more than halve charging times. Typical of electric power, its no slouch under acceleration. Both possess 395Nm of torque which can haul the Kona from standstill to 100km/h in 7.6 seconds. That's less than a second slower than the just released range-topping BMW i3s. Riding on a completely new platform, it is armed with a Display Audio system, which is available with Apple CarPlay, Android Auto and Bluetooth connectivity. Boot space is a reasonable 332 litres with the charging cable on board. That grows to 373 without. Safety features will include cruise control - smart adaptive speed control with stop and go function, autonomous emergency braking with pedestrian detection, lane departure warning system with lane keep assist, blind-spot detection with rear cross-traffic alert, driver attention warning and speed limit information function. Part of the appeal will be the Kona looks like a standard vehicle, rather than shouting its electric credentials. Exterior colours include white, tangerine, blue, red, yellow and grey.